I teach sixth grade – a very tumultuous, confusing, and anxious year for students. It’s in middle school that students really begin constructing a personal identity, and this is an activity I do at the beginning of the year to help get to know the students (and to help the students get to know themselves). I begin by telling the class that I want to know where they’re from, but not just the state or country in which they were born. I want to know what makes each one of them unique. Many of us come from the same city, state, or country, but we all have different experiences that make us who we are. What are the experiences, the “sensory images” that create our identities? I read a poem called “Where I’m From” by George Ella Lyon, and I ask my students to highlight lines that contain sensory details – sight, sound, smell, taste, and touch. I point out the fact that the poet never directly says “I am from [city or state],” but rather tells the reader about sensations and experiences that have shaped her life. After we’ve read and discussed the poem in a little depth, I ask the students to think about the sensory images that define them. What sights and sounds do they cling to from their past? What smells and tastes do they remember fondly? What physical touches or emotional feelings have stuck with them and defined their lives? I use the graphic organizer to help them gather their thoughts, and model one of my own (I include more ‘sight’ and fewer ‘smell’ blanks because I’ve noticed those are students’ strengths and weaknesses, respectively. But edit however you want :). I’ll use a document camera or project a copy of the organizer and ask leading questions to get the students thinking about vivid descriptions of these senses. Then I let the students work on their own. When they finish – and I’ve checked over their work – the students move on to constructing their “Where I’m From” poems from their graphic organizer outlines. With many of my higher level students, I tell them to use the original poem as a mentor text, creating the verses and stanzas as they see fit. For those students who need a little more guidance, I have the poem scaffold. Many of the students who begin using the scaffold quickly become comfortable enough to abandon it, and I encourage that. Technically, the activity can end here. The students can complete a final draft, share it with the class or whatever. In the past, I’ve actually taken a single line from each student’s poem and incorporated it into a class “Where We’re From” poem that can be posted in the classroom. Once the students complete their poem drafts, I ask them to choose a few lines or a stanza that they really like. Then I have them copy those lines onto a single PowerPoint slide and add a couple of images to correspond to those lines. Those are the only requirements: one slide, your chosen lines, 2-3 images. Beyond that, they can incorporate any colors, fonts, music, or videos – as long as they restrict themselves to that one slide. When this is completed, I round up everyone’s slides. This step can be difficult depending on the technology situation at your school. At mine, every student has his/her own folder that is tied to the school network. As a teacher, I have access to every student folder, so I simply ask the students to save their work on the network folder, and I have immediate access. Other options include saving all slides to a flash drive, having students email slides to you, uploading to a wiki or a shared site like edmodo, or saving to a shared folder service like Dropbox. Go with what works. Then comes a bit of work on your part as the teacher: compiling all these slides into an interactive collage. I have a step-by-step guide to hyperlinking in PowerPoint that I suggest you look over if you’ve never tried this before. The interactive collage is built on the same idea, except you’re hyperlinking images instead of text. Once you’ve completed the following steps, you’ll end up with a PowerPoint presentation that opens with a collage of pictures taken from your students’ poems. When you click on a picture in the collage, you’ll be taken directly to that student’s poem…keep reading; you’ll see. This is easy. Open a new PowerPoint presentation in one window (make sure it’s not taking up the whole screen). 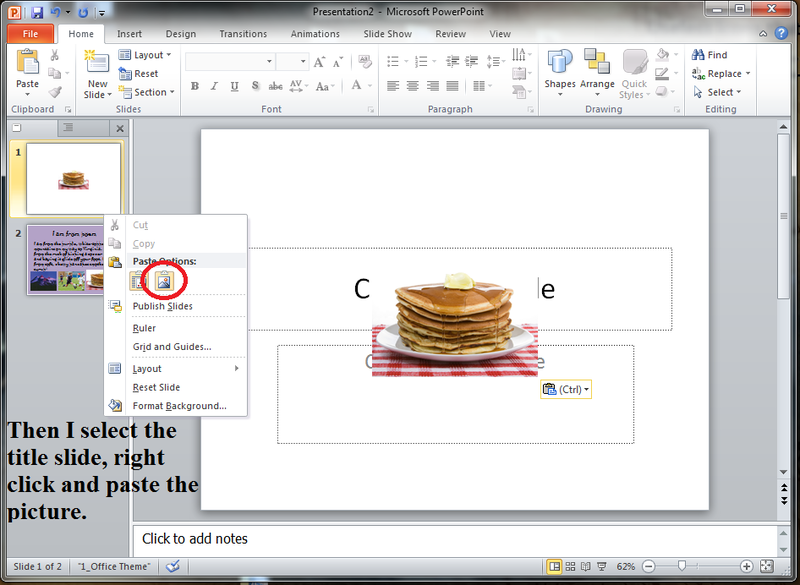 Then open the presentation of the slide you want to transfer in a second window – right click and ‘copy’ the student slide. Paste the slide in the new presentation (make sure to select ‘keep source formatting’ or it might change some things on the slide, like background color). Keep the first slide in the new presentation blank for now. If they’re hard to read, you can click on those images to see larger versions. 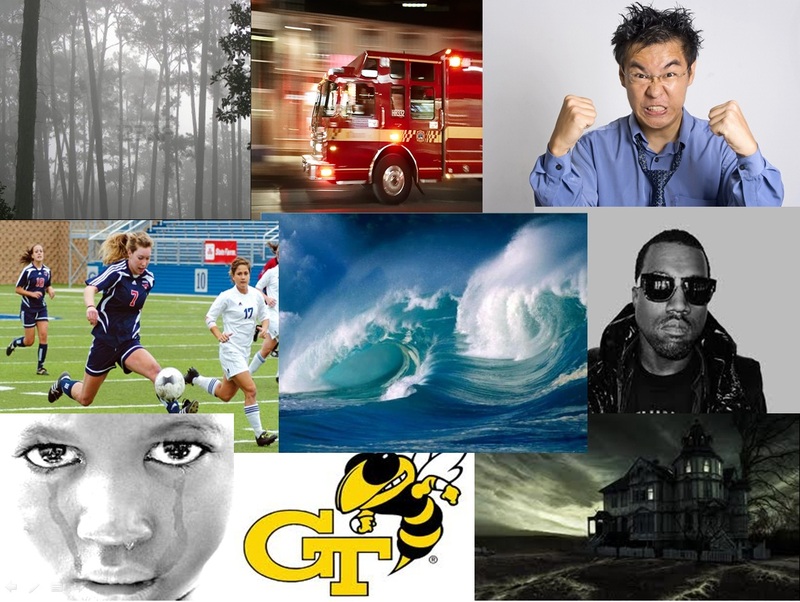 Once you’ve copied all the slides into a new presentation, you’ll select one picture from each student slide to go into the collage on the blank first slide. All you have to do is view the student’s slide, right click and copy one of the pictures, and paste it on the blank first slide. 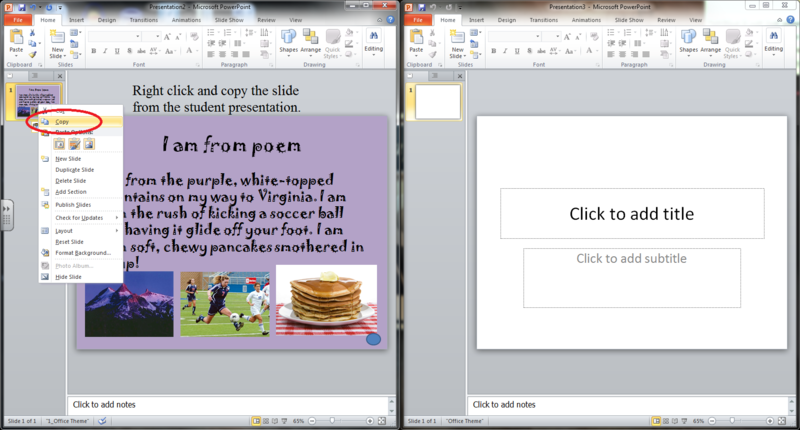 Move and resize the images as needed, then follow the steps to hyperlink each image to its corresponding poem slide. 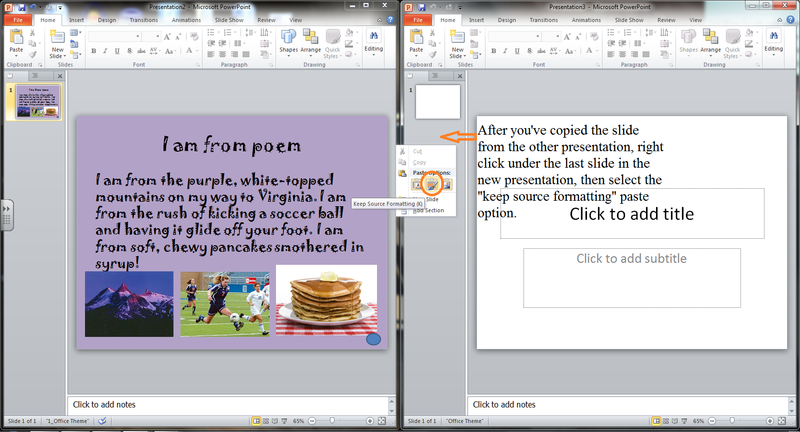 *Make sure you include some way to hyperlink BACK to the collage slide. I like to insert a little circle in the lower right hand corner of each slide that hyperlinks back to the main slide. Once everything is done and linked, you should be able to start the slide show at the collage page. Each image is linked to the corresponding poem, so you can have students come up and click their pictures and read their poems. It’s also fun to set something like this up for a parent night, open house, or meet and greet event at your school. 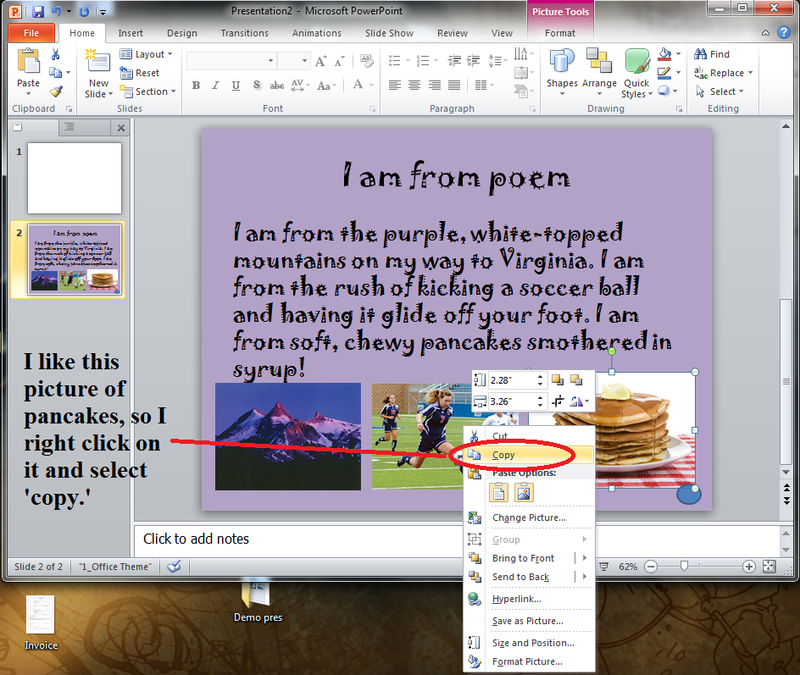 If you have a SMART or Promethean board, it makes the interactive collage that much more fun, since students can actually touch the collage to navigate through it. If you’d like to practice creating and hyperlinking the collage, you can download the practice slides. If you want to see what the finished product looks like, you can download it here. This entry was posted in Lessons, Tips and Resources and tagged collage, education, English, lesson plans, powerpoint, writing. Bookmark the permalink.